You may know Simon Sinek him from his hugely successful TED Talk in 2009, or from reading one of his other best-selling books: Start With Why, or Leaders Eat Last. Aside from being a successful author, Sinek teaches and speaks to leaders and organizations on how to inspire their people. This unique book is told in story form with the combination of illustrations and quotes about three friends. The story is a metaphor that most of us can relate to in some form or fashion. The three friends begin on the playground (which is a representation of the organizations that we work for) and after putting up with the “king of the playground” (who represents our boss or our company), they set off to find a new playground that is better. The metaphor is targeted toward those of us who are looking for a change or are in search of the path to peruse that world that Sinek talks about in the quote above. The book is a short, simple and powerful read that will leave you in thought and inspired. "Our struggles are the short-term steps we must take on our way to long-term success." Our lives are long. No matter the successes or failures we experience, each is only a small fraction of our life. Simon explains it this way, “life is not a single scene. It is a whole movie that must play out…our only challenge (or opportunity) is we don’t know what comes next” (page 133). That statement is so profound, especially in today’s society when we expect results and success immediately. I personally struggle with this quite a bit. If you look at or into most “successful” people or companies, you will often find that their success is a result of a process that has transpired over a long period. The lesson here is to learn to let things play out and treat both the wins and the losses as just a part of the journey. As long as we continue to learn, grow and get better (from success and failure) our results over the long-term will be where we hoped they would be. "When we say out loud what we don’t know, it increases the likelihood that someone who does know will offer help." Sinek says this is one of the most power lessons he’s ever learned and I think most would agree. It’s common place to feel like you need or should know the answer to just about everything. Now, take a step back and think about that: it’s not practical. But in the moment, the pressure and presumed expectation of knowledge makes it difficult not to feel like you should know everything. Sinek shares with us his experience in learning this lesson, “as soon as I mustered the courage to state out loud what I didn’t know or understand, or ask for help or accept it when it was offered, my career completely turn around. It turns out, there were always people who wanted to help…they just didn’t know I needed it. Funny that” (page 127). Whether it is in school, on the job, or just in our lives, it’s OK not to know everything—so don’t feel like you need to! 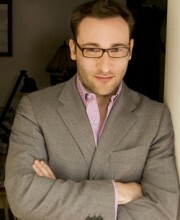 As it was for Sinek, it might be the turning point in your career or your life. "Leadership is an education. And the best leaders think of themselves as the students, not the teachers." What a contradictory statement, right? Aren’t leaders are supposed to be the “teachers”? Carol Dweck wrote a book called Mindset which explores a growth mindset (you can change and grow) vs. a fixed mindset (your traits are fixed). Leaders that have a “growth mindset” know they still have a lot to learn and know that they don’t have all the answers or best ideas. If a leader is set in their ways and is not open to continuing to learn and grow, this spells disaster (most times) for their team. Engagement goes down, productivity goes down, and ultimately, results go down. The effect on the short term results might not be immediate but you will certainly notice them over the long term. Sinek speaks his mind on this topic by writing, “If you have a new idea or perspective to offer and you repeatedly hear, “I’ve been doing this a lot longer than you—I think I know what I’m doing, RUN! RUN! RUN!” (Page 134). “A star wants to see himself rise to the top. A leader wants to see those around him become star” (page 111). I found Simon Sinek to be such a thought provoking author in his previous two books and he has continued to do so with Together Is Better. The book speaks to a simple message—why go at your life and your career alone when you can go at it together with those that inspire and love you. Sinek ends the book with this quote, “What good is an idea if it remains an idea? Try. Experiment. Iterate. Fail. Try again. Change the world” (page 144).